hence, for awhile we called her “Frankenvan”. It’s worked out well for us; we got a lot of good use out of her but she is failing in her older age.Itwasn’t enough that she was totaled twice, but she was actually rear-ended one more time putting a big crease in the rear hatch. The left side sliding door handle broke off a year or so ago, and the right side sliding door is sometimes so sticky you have to crawl in the van through the front passenger door and kick it from the inside. There’s a lot of rust. I suspect it’s because the joints were jarred loose during the two “totallings, allowing more rust than most Odysseys of the same vintage. It has a broken right mirror. The air-conditioning compressor self-destructed last fall. In the winter, there’s very little heat. But the biggest issue is the transmission which is beginning to slip. It is a certain kiss of death when the transmission fails and will value Tina only as scrap metal. So we decided to post it on Craig’s List in Mobile, AL and list it cheap. Turns out I had 4 people highly interested. Antonio was at the top of the list. Antonio’s first language is definitely not English, and we had a few miscommunications, but he arrived and bought it without hesitation. The price was low enough, I understand why, but it means I don’t have to worry about it. As I watched Tina drive away I felt like the Spanish explorer Cortes as he burned his ships in the harbor of the New World so there would be no turning back. Ben and I got to tour the Battleship USS Alabama. Also on the complex, there was a SR-71 in the hanger as well as a submarine. With the engineering defect I have, I marveled at all the mechanisms in the battleship and just the shear mass of it, wondering how it could ever be sunk or the thick steel penetrated. But of course we do know they can get compromised to the extent that they will sink, and did in many instances. Tomorrow is the big day we begin our journey north. That’s all for tonight. Today I got to see the USS Alabama. It was Huge! There were ginormous cannons and huge machine guns. It was crazy! We had a great view of the Gulf. It was amazing! But the Gulf was actually pretty dirty, I thought. We went onto a submarine that had torpedos three times the size of me. The bunks in there didn’t look too comfortable, but I got to lie in one and it wasn’t too bad. I also got to see the Blackbird plane and other fighter planes. It was just amazing. We also saw tanks but, of course, no one was driving them. The boat tonight is lit up; it’s really pretty. We sold the mini-van (aka Tina). It was kinda funny because you know they didn’t speak much English. We took a last picture of Tina as she was driving off. (USS Alabama in the background). In our case, the journey of 1,200 miles begins with one pedal, as well as three flat tires and a broken quick-release skewer. I fixed a flat rear tire last night. It was flat when we arrived at the hotel, so it wasn’t too big of a deal, but when we got on the bike this morning, the wheel was really out of round. I stopped and tried to center it up. I took all the air out and re-inflated it, which is no small task because I have a little pump that takes literally about 200 strokes to inflate the tire. We pedaled across the bay to Spanish Fort. After breakfast at the grocery store, we started pedaling again. The route is pretty hilly. It was getting warm, but we managed to put in about 8 miles beyond Spanish Fort when, just as we were cresting a hill, the back tire went flat again. We found a shady spot, and I took the rear tire off. This time, the tube had failed. The metal stem had separated from the rubber, so there’s really no way to patch that. I put our only spare tube in and pumped it up. I put the wheel back on, and when I was tightening the quick-release skewer, the skewer snapped. This is something that has never happened to me in my life. I don’t carry a spare skewer, so we were basically dead in the road. Fortunately, we were really close to church, East Pointe Baptist Church. Unfortunately it was locked and no one answered my knocking. I called Andrea to have her look up the church on the internet and call it to see if anyone was inside. A very friendly Sylvia answered and explained the doorbell system. At the same time, a fellow came with a pick-up truck, and I told him our situation. He was very friendly and gave Ben and I a ride into town to a bike shop where we bought a new skewer. Actually, they gave us the skewer. I bought an extra tube, and we went back to the church so I could put everything back together. I had the old spare tube in at this point. Overall, the delay gave us a nice taste of Southern hospitality. The church secretary, Sylvia, took very good care of us, and the gentleman, Craig, who took us into town, was a real blessing. Unbelievably, we got back on the bike, pedaled probably a mile and a half, and the back tire went flat again. This was really discouraging, as you can imagine. So once again we found a shady spot, took off the tire, and discovered that the spare tube had done exactly the same thing, separated from the rubber. I don’t know if it was two defective tubes, or they were getting old, or what, but fortunately I had the brand-new tube. I installed that, and we were off again. Riding today was a bit difficult. Rolling hills and hot—probably in the mid to high eighties—and our bodies just aren’t in shape yet. We don’t have what we call our biker legs. It takes a while to get your body accustomed to cycling. 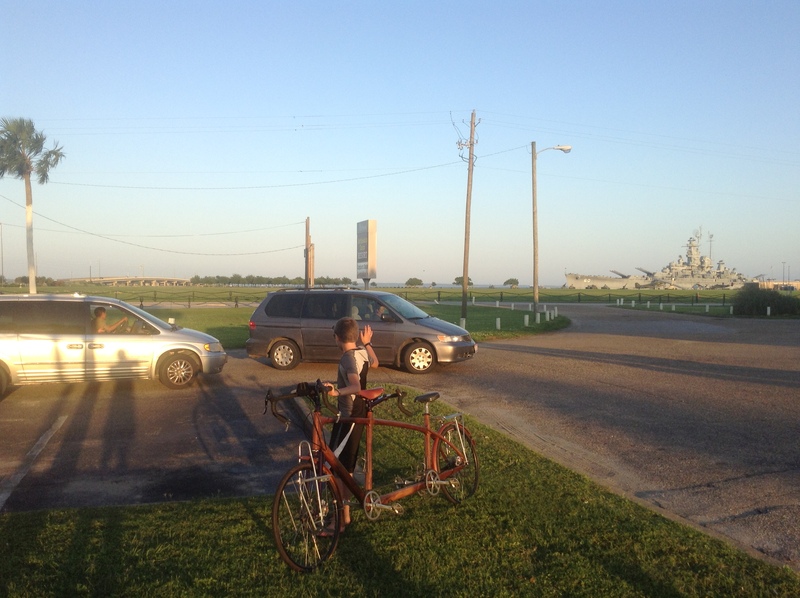 We pedaled into the town of Stockton, and were trying to figure out where to stay tonight. For obvious reasons we didn’t get in the miles we were hoping for, logging only probably 40 miles or so. We went to a diner called the Stagecoach for dinner. It was a really neat place—locally owned with great food. We had a very friendly waitress, and the manager of the café was having dinner there, as well. She was interested in our trip and said that there is a campground about five miles off the trek. She said it was worthwhile, but I wasn’t that interested in going off the trail that far. So she said, “Oh, I’ll have my cook take you in his truck. He’s not very busy tonight, so just load up!” Well, I have a pride issue. I don’t like to accept rides on a bike tour, but Andrea is starting to break me of that. While I was waffling, went back to the bike and saw that my front tire was flat – that kind of sealed the deal. I was willing to take the ride. Chandler took us to the campground in his truck, and before we left, the café manager said, “Give me a call if you need anything. I can go into town to get a tube if you need me to.” I said it depends on if I could patch it. Well, I could patch it, and it looks okay. I’m not too thrilled to ride without a spare tube, so I’m still trying to decide if I should take her up on that offer. I don’t know if I will or not. It’s been a good trip so far on our first day to see how God provides. It’s exciting to share these experiences with Ben, ending up in the right places at the right time and seeing God bringing people into our path to help us out. It’s an interesting adventure that we’re beginning. Hey Mom, this is Ben. I got up pretty late this morning. I think Dad sent a picture of me sleeping lazily in the hotel– it was so comfortable. I had my own big bed. We got up, we got dressed and everything. We could see the Battleship from here. It was so pretty. It looked really cool. We could see the tanks and all the airplanes and the submarine. We got on our bikes and set off. We were biking and biking. All of sudden we hit the highway that crosses the Mobile Bay off the Gulf of Mexico. There was a huge bridge and semi trucks going past us – it was crazy! Then we got to the land and we saw all these seafood places, like bass and I didn’t think of eating bass or lobster for breakfast. That doesn’t sound too good to me. Finally we got to a campground and we stopped to check it out – it’s where we had considered staying last night but decided to stay back in Mobile. You could see the Gulf of Mexico from there – you could see so far out into the ocean; it was amazing. From the bridge, the gulf didn’t look too clean but apparently it was just really shallow and sandy. I walked out into the water and all of a sudden a crab just shot right past me! Dad dipped the back tire of the tandem into the Gulf and after we cycle the whole way to Ohio, we’ll dip the front tire into Lake Erie and have cycled America the whole way from south to north. We played in the Gulf a bit more and picked up some driftwood for a souvenir. We started biking again but got lost and couldn’t find ourselves. We stopped at a visitor center and this lady came out with a huge Southern accent. She gave us a bunch of directions and ideas on good places to eat and how to get on the highway and stuff. We began pealing again and her directions didn’t help us one bit. We found an abandoned store place that was creepy. There was a guy walking in. We asked him directions and he told us so much valuable information, like creeks that are good for water and how to get to Highway 225. He also told us about a Subway we could go to for lunch but we didn’t want to do that. We found a different store and stopped and got some poppy seed muffins which of course I wanted; Dad got a blueberry one. We got a juice and went out by our bikes and ate. We drank the whole entire jug of juice; we were so dehydrated. I felt so good after that. The guy who gave us directions told us Highway 225 was super hilly but we weren’t really thinking about that. We got on the highway and it was so hilly, it was crazy. We were going up and down and up and down. The hills were so long but the downhill on the other side was so steep, we went really fast and didn’t get much break. Finally we got past all that and ended up in a sketchy town that was creepy. It was like an old-fashioned creepy place with a store with bars on the windows. The door was a gate with a metal door that was open. We went in and the people in there were really nice. We got some some stuff and left. The people told us there was a good restaurant across the street. We ate there. They gave us directions to the campsite where we are now. They were so nice, they let one of their chefs who had a pickup truck take us to the campsite which was like 4 miles away. The owner of the camp came out and saw the bike and was like, “Wow!” and stuff. He was so nice, he let us use one of the golf carts to get over to the campsite. He was just great. Dad asked how much for the site and he said, “Free!” because we were bikers and just had a tent. Now we’re just sitting around and Dad’s taking a shower. On this trip we’ve seen some weird animals. We saw a boar on the side of the road and some smooshed armadillos as well as a bloated deer. I was wondering if we’d see some other weird animals and we did. When we got here we checked out the bathrooms. Dad went in first and said, “Ben, come here!” There was a chameleon running around and all of a sudden it jet past me, the color of the wall and ran in a little crack. I got ready for a shower and all of a sudden froze! I called for Dad, and he came over. It was a tree frog, a tiny little tree frog! We caught him and set him outside. Then I got in the shower and there was another tree frog in there with me! It creeped me out wondering what else might be in there. It was freaking me out and making me not want to shower. I pushed him out and showered with my shoes on of course cause it was so gross, like leaves and razors and mosquito eaters that I kept smashing. So that was my creepy shower that Dad’s in right now and that I didn’t like. We woke up at the campground to low front tire. It wasn’t flat but it was low—discouraging because it was our last tube. I took the tube out and soaked it in the river, trying to find the leak to no avail. Finally I decided to just put it back in and see what happens. We really don’t have much of a choice. I hope it will make it to the next bike shop. Pedaling here is very challenging. The hills are long grinds. They’re not particularly steep, but they’re long; not like the Ozarks which are similar to a roller coaster where you slam down one and have enough momentum to nearly coast up to the top of the second hill. It’s not like that at all. It’s just long, painful cranking and grinding. It’s extremely rural here. The little towns that are on our map are literally one or two houses. The biggest town today was a town called Little River. We pedaled right past it. It was just a gas station with a café and a convenience store. I turned around and asked the fellow that was pumping gas if this really was Little River. He said, “Yep! This is it.” He was very talkative and full of stories and also interested in what we were doing. After talking with him, he handed me a twenty-dollar bill and said, “Hey, I want to buy you guys lunch today!” Bizarre! I think he was blown away by the fact that a ten-year-old boy was riding his bike across country. We got to Purdue Hill, and I’d had enough. It was about another 25 miles until Grove Hill, the next town of any substance. There was no official place to stay in Perdue Hill so we asked the owner of a grocery store if we could camp behind the store, and he said yes. I took a garden hose shower tonight and pitched our tent. We had visions of staying in a hotel in Grove Hill, but that isn’t going to happen. This is what bicycle touring is all about. Hey, Mom! Today I woke up at 6:30 in the morning. Dad was up, and we got ready and brushed our teeth and everything. 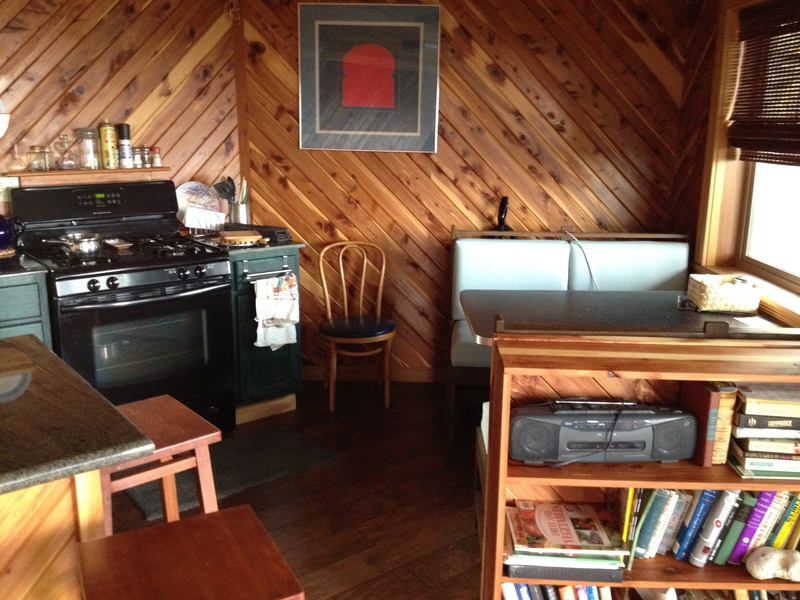 Then we went to the cabin—it was more like a shop—where the owner of the campground stays mostly. As we were heading up there, Dad noticed we had a flat. The owner of the place tried to help us. He was really, really nice. He tried to help Dad find the hole, but there wasn’t any hole. It was just leaking slightly from last night. At 9:30 we just figured there was no hole, and we left. We were biking up and down, up and down with a lot of dead stuff like armadillo on the side of the road, and really kinda gross snakes and yeah. We’d stop every once in a while and have a granola bar or something. He told us there is this really good spring with crystal-clear water that’s nice, so we went there. It was a really, really nice place, except for the bugs, which were horrible. We ate, of course, another granola bar and had some pretty good water. We keeped on biking and biking. Probably a couple hours later, like at 2:00 or something—central time—we were just completely out of water—no more water left! It was really bad, and we were cycling all these ups and down. It was so hard. We went through a place called Little River, and we thought it would be a pretty big place. We saw some little tiny towns that said it was pretty big. So we got to Little River, but we didn’t know that we were there. We saw a gas station, but we passed it and kept on going, but then nothing was there. It was just a bunch of trees and stuff, and we didn’t see a town, but we should have been there. Then Dad was like, “Was that gas station it? !” So we went back, asked someone in the gas station, and he was like, “Yep! This is it!” So we ate some lunch there. I had chicken tenders. It wasn’t too good. Dad had meatloaf. The meatloaf was the best. There were also dogs, and one hanged out with us, and I gave him the rest of my chicken tenders. After that, we left and got to a little bit bigger town and saw a gas station. We were going to have to do a really long day today, but Dad couldn’t take it anymore. So we just stayed there. We got some bananas and stuff. The bananas were pretty good, after all the day of only having granola bars. It was really good. That was around 3:00—central time. I was thinking about Jon a lot and how he is in school right now, and I was like, “Wow, I feel so bad for you guys.” But I was thinking that they are probably thinking about me, and I was kinda happy about that. The owner of the gas station had a house next door, and she let us camp in her yard, and that’s where I am right now. Dad’s taking a shower with the hose. He’s coming back now. And that’s the day! Oh, and our dinner’s noodles stuff—it wasn’t too good—with meatballs, and… you wouldn’t have liked it. The kindness of strangers continues to amaze me. Last night, a fellow who bikes occasionally came by the store where we were staying and struck up a conversation. I asked him if there was a bike shop anywhere near where we were heading. He said, “No,” but asked what we needed. I told him I needed a new tube with a presta valve, and he said, “I think I might have one. I live about ten miles away. I’ll go see if I have one, and I’ll be back.” And he did! He brought back a 700 c tube, where mine’s a 26, so it’s bigger. I had to fold it up to make it work, but it seems to be fine. This creates a far greater peace of mind than riding on the leaky tube I was using yesterday. Riding today was very challenging. 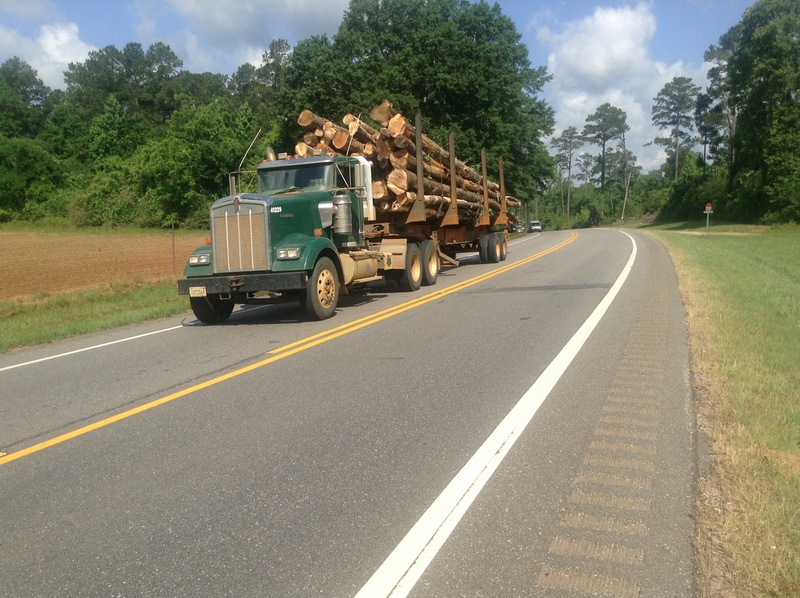 There is heavy log-truck traffic on Route 84. To make matters worse, there are rumble strips on the shoulder of the road in the area I would like to be pedaling to maintain a safe distance from the trucks and the edge of the road. We cannot ride on the strips because they would rattle our teeth out, so we are forced to ride in an area about eighteen inches away from the rumble strips and the white line. That is way too close for comfort. The logging trucks whip back and forth, sucking us into their trails. Sometimes two will converge at the same time as us, forcing us to bail out—over the rumble strips, into the shoulder, slamming on the breaks. Benjamin did not seem to quite get it. He seemed to be thrilled by the blast of air that was rocking our bike back and forth as if we were body-surfing. Whereas, it made me think I may need to change my laundry. We only rode slightly less than thirty miles to Grove Hill, but I was so wigged out that we ended our day there. This made sense since there is a hotel here, a good place to recoup. This will also set us up strategically to make a better day tomorrow and subsequent days afterward. We are taking a pseudo-rest day. I received the phone call this morning that I have been dreading. Andrea told me that my mom, Rheba Anne Eaton Kinsinger was promoted to Glory this morning. She had Alzheimer’s, so we have been saying goodbye for a long time. Last time I visited her, I received a gift from her: a crystal-clear, “I love you.” Normally, she could not say anything. It was a hard decision to go on this trip, knowing that she was failing, but the nurse assured us that she was not “actively dying,” and she could hang on like that for another month or two. We decided to go ahead and go, and take our chances, knowing that this is the kind of thing that she loved and would have liked for us to be doing anyway. Ben and I had a good cry together this morning, and with a heavy heart, we set off, later than we anticipated. Our goal today was to get to Linden, and I noticed on the map that Route 43 makes a beeline there. I wasn’t in the mood to fight logging trucks today, so I decided to take 43, even though it’s not exactly the scenic route. The road is heavily traveled but has a nice shoulder. The route seemed that it would have been easy traveling, but the shoulder was littered with debris. I thought it would be a miracle if we did not get a flat. Sure enough, I had been pedaling less than a mile, and my back tire went flat. We pulled off on the side of the road, and a lady pulled over asking about our trip. She offered us her breakfast. She had just bought a subway breakfast sandwich. She was a very sweet lady who, in her Southern drawl, told us that God told her to pull over, so she did. We had eaten already, but we thanked her anyway. She asked where we were going, and we told her Linden. She told us we were going the wrong direction. In my haste, I hadn’t thought to check the sun and our direction. I just assumed we were traveling the right way. It turns out I was headed toward Jackson, instead, which was actually on the route that we were supposed to be pedaling. We were supposed to go south a little bit to go north. So that was a bit discouraging. Also, strangely enough, the wind was coming from the north today instead of the usual southerly wind which was the other reason I thought we were headed north. I took the rear tire off and inflated the tube. This is the tube I bought in Spanish Fort which is the best tube I’ve got; it’s the one that actually fits. I pumped it up looking for the leak and while I was pulling on it to find the hole, the tube ripped in half. My only spare tube was the one with the slow leak that I have to pump up every 10 miles. I called Andrea and had her check online at the 2 nearest towns for a bike shop, but the best we could get was a Walmart. In the meantime I put the spare on when a truck pulled over. We were on his property. He offered to put our bike on his truck, and he took us to Jackson. We stopped at a tire/hardware store but they didn’t carry the right kind of tube with the presta valve. 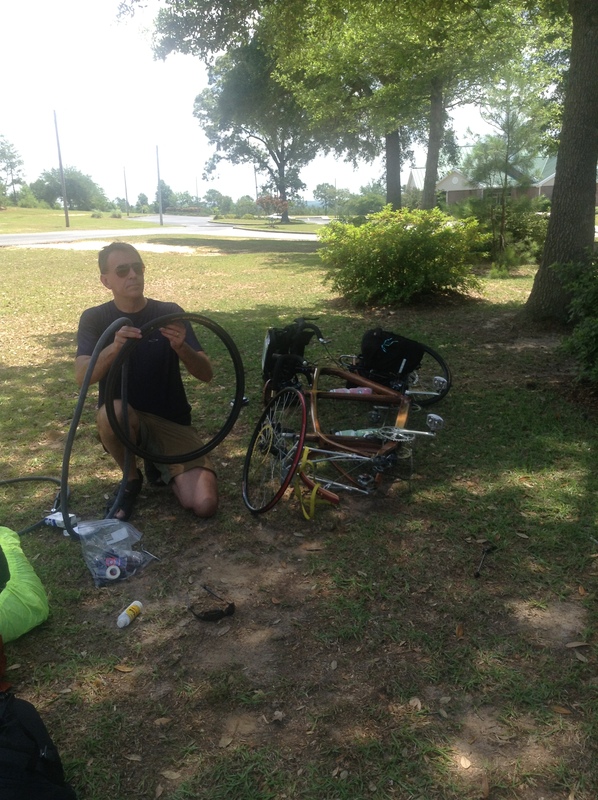 The lady there graciously called around and found that Walmart carries presta valve tubes so we pedaled to Walmart. Unfortunately, they only carry 700 c tubes which is too big. With no other choice, I ended up stuffing the 700 c tube into my 26 inch tire again, which is the scenario I’ve currently got on the front tire, and I bought an extra tube. It’s not great, but it seems to be working. By this time it was noon and I really wasn’t in the mood to ride. We checked into a Best Western with a pool. Ben spent the whole day in the pool while I dealt with the loss of my mom. This is the first time I’ve lost a parent, and I feel like one of my anchors has come loose. It’s funny how at 52 years old, she’s still Mom. I know how faithful she was to pray for me every day. I was by far the most challenging and difficult child, but as an adult I feel like I was her favorite. If you don’t believe that, just ask me. Yesterday, the 24th, we got up and started biking and got a flat tire, again! We were thinking a piece of glass went in the tire. A lady pulled over to help us soon afterward, and she offered her subway breakfast sandwich. She said she was guessing we didn’t have breakfast that morning. She was so nice. She also told us we were going the wrong way. We had made a short cut where we could get to the next town by going straight north instead of following the route that had us go south to then go north which was just kind of stupid. But accidentally we were going south anyway. So then another person pulled up. He had a big truck. Apparently we were on his property and he had some valuable stuff in his barn, but when he saw we were on a bike, he didn’t expect us to steal anything. He offered to take us to Jackson which is the town to the south. We found a tire at Walmart for some strange reason. Then we went to McDonalds, and we saw the same lady who had pulled over and offered her subway sandwich. I was like, “Dad! Come here! It’s that same lady who offered us her sandwich!” She came over and talked to us for a bit. So we left and decided to go to a Best Western which was a really nice hotel with a pool, which of course I would love. First thing I did was jump in the pool. I swam for hours and hours, but I forget to put on sunscreen. Now my face is red; my arms hurt so much and my ears are killing me! We left for dinner and then stopped at a hardware store we had been at earlier looking for a tire, and Dad bought me a knife that I’ve been wanting. It’s a really nice whittling knife. So back at the hotel I got a piece of wood and whittled into a pizza box and watched Mega-mind, one of my favorite movies. I was so happy whittling, I didn’t even notice how uncomfortable I was with my sunburn. I did that until about 9:00 – central time. I woke up the next morning happy, but I knew we had a huge day ahead of us, 60 miles I thought, at least. I’ve biked 60 miles before but, wow, we did the calculations wrong. We were biking, and biking, and biking for so long. When the cycle computer read 60 miles, we were nowhere near the town we were trying to get to. We knew we were on the right road since it went straight into that town. 70 miles. 75 miles. 78 miles. What’s going on?! At 80 miles, we were kind of freaking out – where are we?! Finally we got there at 88 miles! We checked into a hotel and I plopped in front of the TV, exhausted, and found Star Wars to watch! Here’s a stereotype-breaker for you: I was sitting on the shady side of the pool, and the mother was on the other side, sunbathing in a black and white zebra-striped bikini, smoking a cigarette, reading the Bible and Tim Lahaye’s Left Behind book. This Best Western was a treat today. It was comfortable, clean, and nice—just what the doctor ordered after an emotional day yesterday. We were able to get an early start, around 7:00 in the morning. It was nice and cool; cool enough that Ben even wore his windbreaker. We followed Route 69 all day with hardly any traffic, a huge relief after the logging-truck exploit we had in the past. The ride also was barren. The towns were few and far between. We rode thirty miles until Coffeeville, and I tanked up there. I bought two boxes of granola bars. There was nothing between Coffeeville and Linden. We consumed both entire boxes of granola bars and a one-pound bag of M&Ms before we made it to Linden. The mileage I had calculated based on the adventure cycling map was somewhere close to sixty miles. Instead, we rode eighty-seven miles to get here. We were totally out of gas. I’m super proud of Ben. He pedaled his little heart out all day long. I had a good time of reflection about my mom. Sometimes it was hard to pedal because I was struggling breathing from being choked up, but other times I was rejoicing thinking of what a great mother she was and how fortunate I was to have had her as my mom. I also am rejoicing that she is free of that mind that had her soul trapped. Overall, it was a good day. I feel like I have finally got my biking legs, but of course, with biking legs come saddle sores. We were pretty whipped from our nearly-ninety mile day yesterday, so we got a late start this morning. I think we were on the road by about 9:30. 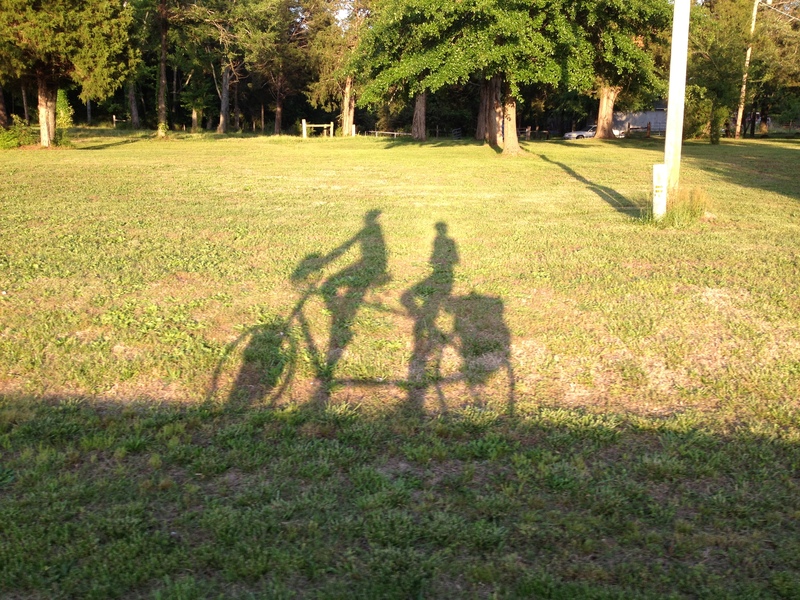 We pedaled to the town of Livingston, about forty miles away. My goal on this trip was to average 50-60 miles a day. I think we are reaching that, but it is because we are in extremes of high-mileage days and low-mileage days. It’s so remote here; we have had difficulty finding a place to stay with any semblance of civilization. In addition, cycling is not very popular. It’s too hot and humid all the time. This is a challenging place to cycle, but it is working out, and we are enjoying the famous southern hospitality and friendly people. Bob Braisted is a friend that is closer than a brother. We have been friends since 1983. We cycle toured Europe in 1989 along with my brother, Jack. August of 1990, Bob was in my wedding, and in September of 1990, I was in his when he married Michelle. He is truly a lifelong friend. He moved to Nashville, TN in 1995, and we still try to get together several times a year. Bob’s mom, Joanie, passed away on May 19, and five days later, my mom passed away. Bob was the first one I called when I heard the news, and we had a good cry over our mutual grieving situations. The service for Joanie will be this Wednesday, and it’s killing me to not be there. I am also seriously struggling with grief, compounded by not having my family, my father and my siblings to go through this process with. Benjamin is great, but he doesn’t quite understand, so it has been a painful few days for him as well. I had a fitful night last night, pouring over maps and strategizing, seeing if I could find any way to make it up north to attend Joanie’s memorial service and be with my family. I finally decided I could hitch-hike to Nashville. Bob is leaving from Nashville to come to Ohio on Tuesday, so if I could get there somehow today, I could just ride along with him and his family. I was agonizing over this idea because on one hand, it meant cutting out part of our trip, but on the other hand, it would be an opportunity to be with my loved ones during this difficult time. So I called Bob to pitch the idea, and he immediately expressed interest in helping out. He said, “I’m heading down. Just tell me where you are, and I’ll come and pick you up.” In the meantime, I was trying to find a ride up north to save some distance because we were still a good three and a half hours from Nashville. Ben and I did something a little bit risky and probably illegal. 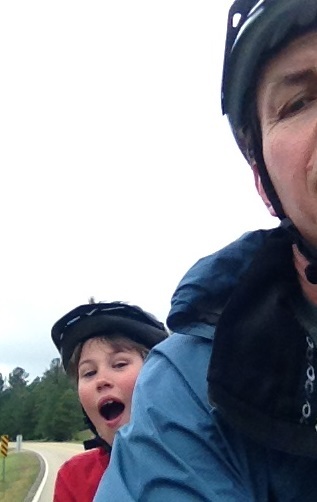 We pedaled our bike down the interstate ramp of I-59 and stuck our thumbs out. I have hitchhiked on my own a few times, and it’s not great fun, but it’s do-able. Having a ten-year-old along with you when you’re doing it just seemed wrong. After about 20 minutes without any response, we decided this wasn’t worth it. We pedaled back up the ramp and started to ride our bike along parallel to I-59 as far as we could to not only save some miles but also give us something to do for the next three and a half hours. 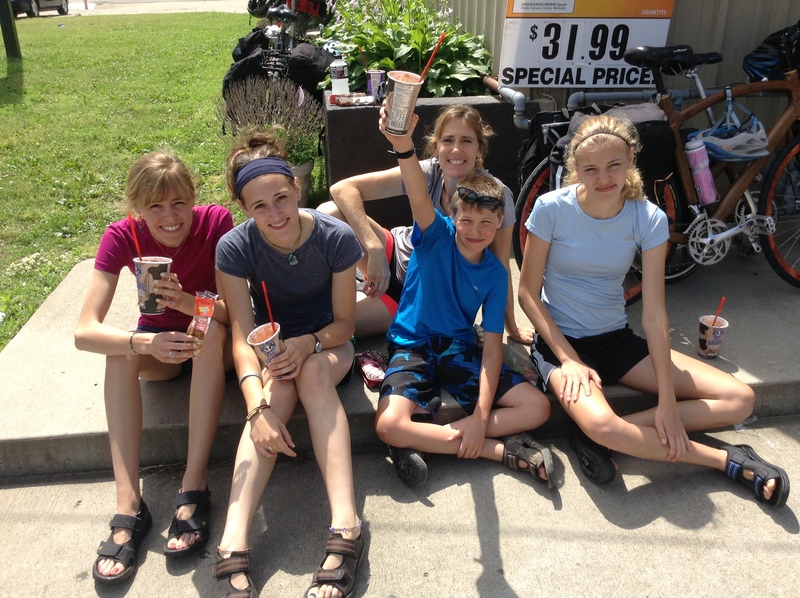 Bob met us around 3:30, and we loaded up our bike and panniers in his van and drove back to Nashville. The cycling part of this adventure is on hold for at least four days. We said our goodbyes to Bob and Michelle, Matthew and Andrew at a hotel in Bowling Green, KY. They dropped us off on their way back to Nashville, TN. I told Bob that this has been the best worst 4 days of my life. We had the shared experience of grieving over our moms. This week was Joanie Kissel’s visitation and memorial service (Bob’s mom) ,and I also got to see my dad, sister and brother for the first time since my mom died last week. There were a lot of tears shed, but there was also a lot of laughter and celebration of two lives well lived. The laughter and the tears mingled sometimes. We did take in the Corvette Museum before the Braisted family left which was a lot of fun. So the plan now is that Benjamin and I will start pedaling tomorrow. We’ll get back onto the trail with a pretty significant gap between Livingston, AL and Bowling Green, KY. This gap may be filled sometime, but for now it will just have to be that way. Today would have been my Mom and Dad’s 60th anniversary. It rained a good part of the night and was raining this morning, so we got a late start. Because we are off the official route, we are not using the ACA (American Cycling Association) maps. We’re doing our own thing. Before we left home yesterday, Ella found a bicycle route feature on Mapquest so she printed off a map for us. The problem is street names change sometimes and Mapquest may or may not have the current information. So we were unable to find some of the roads at the beginning of the day. The most significant issue was it misted or rained off and on all day long which fiercely smeared the ink on our maps which were printed on regular computer paper. There were literally 30 turns on the route today. Benjamin was the navigator from behind and had his work cut out for him. We also had some significant climbs. It’s amazing how quickly the biking legs disappear. Saddle sores are gone, too; I’m convinced they go together. We made it to the hotel in Leitchfield, logging 58 soggy miles. We are soaking wet and happy to be inside. We’ve adapted a new strategy for the remainder of the trip. We have to be home by June 9 in order to be ready for my mom’s memorial service. So we jettisoned the camping gear; now all we have is two panniers with our clothes and a credit card. It’s the first time I’ve ever done it this way, but we can cover more mileage with this plan. The bike has been lightened up significantly. I wouldn’t be surprised if we shed 20-25 pounds. It’s a new experience,one with a hot shower guaranteed at the end of each day. Nice. Today’s the day we met the girls and we had about 70 miles to get to Lewisport, KY. We decided to take a utilitarian route and ignore the 30+ turns on our Mapquest route. We shot straight up Rt 54. About 10 miles out, we ran across a sign which is always a conundrum for cyclists: “Road Closed: Open to Local Traffic Only” next 7 miles. When you’re on a bike, there’s usually a way you can get around anything that’s an obstacle for cars. I’ve even gone so far as fording rivers before with a bike. So it’s risky but we decided it was worth the chance. We pedaled on a nearly pristine, no traffic road for about 7 miles until we came to the obstacle in question: a bridge under construction. Since today is Sunday, the workers were not there. Most of the bridge was still intact. The guardrails and concrete bunkers on the side were knocked down, but the bridge was still very much passable. We hefted our bike over the barriers and ventured across the bridge. We crossed safely then took a bit of a break and walked down to the river to see if we could swim. There was no clean way to get to the water, and the river was rushing too quickly anyway, so we hiked back up to the road and decided to do a boy-thing. We began hefting large chunks of concrete into the river just to hear them splash. I don’t know when you’re too old to enjoy such a thing, but it must be sometime after the age of fifty-two. We spent probably a half hour throwing rocks off the bridge. Finally, we decided to ride on. The weather today is ideal: mid-seventies, no wind, and some nice sunshine. It wasn’t terribly hilly until we got onto route 69, and as we got closer to the Ohio River, it got hillier. We were climbing probably the hardest and longest hill of the day. I was in my granny gears, and it was one of those hills where you focus on the top of the hill, hang on, and wait for the end. Suddenly, we came across a scene that was almost surreal. There were a couple big, leather vest-clad, guys with ponytails. The word redneck comes to mind. They were sitting in a minivan with the stereo cranked really loudly. You would expect them to be listening to something like AC/DC or Hank Williams or Charlie Daniels, but no! They were listening to a hymn: I Come to the Garden Alone. This was a hymn that my mom loved to sing with her three sisters, one of her favorites, a song that will be played at her memorial service. I was already oxygen-deprived as we were climbing the hill, but suddenly my throat tightened with emotion, and I could hardly breathe. I started wheezing and hacking, the queue Benjamin takes to pedal harder and faster. I felt the familiar surge from behind. Fortunately, he got us to the top of the hill. We arrived in Lewisport about fifteen or twenty minutes after Andrea and the girls made it there. It sure was good to see them. We went to a Mexican restaurant for dinner, and as the girls settled in, I surveyed the hotel room and marveled at how much more complicated and how much louder our life had suddenly become. The ride this morning began idyllic—good weather, nice and cool, a really quiet road that meandered in and out of the Ohio River, with frequent glances of the river. We are back on the official ACA, underground railroad route. The scenery was fantastic. We pedaled about ten miles to the town of Hawesville. We all indulged in some premium biker-fuel: milkshakes, peanut butter crackers, bananas, peanut M&Ms and had a nice little picnic there. We switched bicycles around a bit because the single Andrea was on was a bit too big for her. We put her on the tandem, a better fit, and thought Benjamin’s seasoned legs would be a benefit as well. After Hawesville, things began to get extremely hilly as we departed the river valley. We went over some pretty major hills. We knew that we had over-scoped the day, attempting seventy miles on fresh legs and bums, but we did not have a choice, since that is where the next hotel was. We were going slower than what Benjamin and I have become accustomed to because we have our biker legs and the girls don’t. That was okay because we were having fun and not worried too much about the pace. There is a scene in the classic Emperor’s New Groove where Kuzco finds an old man who had been punted into a tree who warns him not to throw off the emperor’s groove. Benjamin and I were definitely thrown off our groove today, but that’s okay. As the day progressed, the situation became more and more desperate. It was getting scary. The pain was very evident in the girls’ faces. We just kept grinding along because we did not have a choice. The weather was beautiful, which was a huge blessing, but further and further along we had to keep taking more and more rest breaks. After eleven hours of pedaling, we finally arrived in Brandenburg. It was nearly dark. To say the girls were spent would be an understatement. The deck was really stacked against the girls. We knew that a seventy-mile day for the first day was not a good idea, not to mention a hilly seventy-mile day. A good rule of thumb for cycling is that the first day is reasonable, not terrible. The second day is maybe a bit worse, but the third day is the worst of them all. Then, after the third day, you seem to get your biker legs, and things start going well. The fact that the girls were a bit beat up after the first day is not a good sign. If my formula works out, they will just start enjoying the trip when the trip is over. An analogy is that if Benjamin and I have been training for a marathon run, and the girls come cold-turkey and they try to join us on a 10K run, that simply is not fair for either of us. I woke up at my normal time, somewhere around 6:00 and snuck out of the room to let them and Benjamin sleep. I think they woke up somewhere around 9:30, and by then breakfast was not being served anymore. They were very concerned as they were unable to sit comfortably on even a soft bed, let alone face a bike seat again, and the mileage wasn’t going to improve much if at all. Andrea and I had some difficult conversations, trying to figure out what to do next. Finally, we decided it was best if we had Ryan come pick them up, and Benjamin and I will continue our game as planned. So, we said our goodbyes once again, and now it is just Benjamin and me—as the Little Rascals would call it, the “He-Man Woman-Haters Club,” just the boys. The ride today was actually quite lovely. It is a shame that the ride we did today was not the first ride for the girls. We expected to ride sixty-two miles today. My computer read seventy-eight miles. This was partly due to miscalculation. Probably I counted for about ten of the miles, and then I took about a two-mile misstep. But the real kicker was at the end of the day, when we were well spent, we had to pedal an additional four miles uphill to the interstate to get to the hotel, a total of eight miles round-trip. It hurts a bit, but here we are. The ride today was gorgeous, perfect weather again, close to eighty degrees and sunny. We were on nice quiet roads; American Cycling Association does a good job of keeping us off the main roads and putting us on quiet, obscure roads. 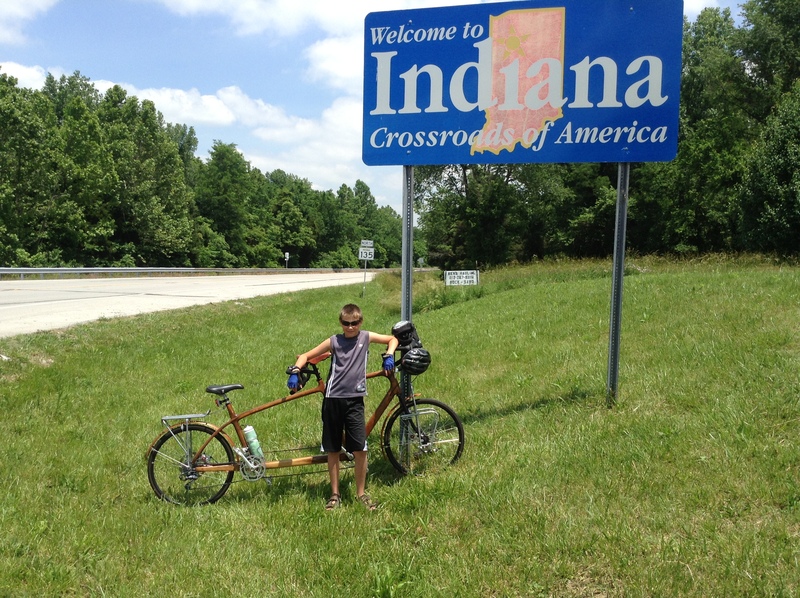 We pedaled through Madison, IN, and we crossed the Ohio River again, back into Kentucky. Madison was an interesting little town. There is a movie called Madison about power-boat racing, so it was fun to see the town, which is the home of the famous power-boat-racing team. We had a bit of a surprise as we were pedaling along the Ohio River on Rt 36, a detour sign. As mentioned before, those usually don’t hinder us, so decided to go through it. But this time, it was a serious detour issue – about a mile of very loose gravel, so we had to walk the bike the whole way. Again, it was fortunate that the time was after 5:00, so the workers had all gone home. Otherwise, they probably would have turned us around. This is all part of the adventure. When Dad woke me up, I opened my eyes, and bam! a shot of light went into my eyes. I was like, “Ohhh, that’s not nice.” He, of course, had the shades pushed to the side, so all the light was coming in, plus the lights were on—a horrible wake-up call. When I finally got up, I was scrambling all over the place, tripping over the bed. We finally got out to start pedaling . When we left there was this old abandoned hotel nearby. There were mattresses along the windows, and looked really creepy. A sign said, “Closed for Renovation.” We stopped at a Walmart and Dad bought me an air soft gun! I was so happy because I can shoot dogs now that go after us. When we got to the country roads, sure enough I got the opportunity. It was so fun. The first one came right up behind us. It was a really mad dog. I turned around and shot him right between the eyes. I was like, “Yeeees! I did it!” It was fun, but it was really cruel, too. My conscience was kinda not happy, but I was having so much fun. I was shooting dogs and keeping them away from us. The terrain wasn’t too bad today, except for one ginormous hill after we had lunch. I was like, “Ugh, I don’t think we can do this.” Then, Dad took a stop in the middle of the hill, and I was like, “How are we going to get going again?” Finally he was ready. Somehow, I don’t know how, Dad got to a start, and we were off. We got to this town where we set down our stuff and found some food. We went to a Chinese buffet, and had these cakes that were so good. They were doughnuts with sugar on them. I called them hotcakes since they were so hot. They were really good. We ate too much. Jerry Strange is a friend and former colleague of mine when I worked at the University of Dayton (U.D.). I took advantage of the tuition remission benefit when I worked at UD and parleyed my associate degree into a bachelor degree. Jerry was my Differential Equations professor, a course I “enjoyed” so much I took it twice. Jerry and his wife, Hylda, purchased a historical “fixer-upper” summer home right on the banks of the Ohio River in Ripley, Ohio in the mid-eighties. The Stranges are cycle tourist as well, having traveled the British Isles and Continental Europe by bicycle. Jerry and Hylda, along with their Ripley neighbors, would host an annual cycling/carry-in/cookout every year, and Andrea and I participated a couple times as newly-weds. That was twenty years ago! I’ve frankly lost touch with Jerry. Our route goes right through Ripley. Through a mutual friend, I was able to track him down. He and Hylda happened to be in Ripley for the weekend, and he invited us to stay the night at their place. We had a great time with them. Hylda shared the history of the area with us and told us true stories of slave liberation through the town and people of Ripley. It was truly the best history lesson we received on the whole trip. Ulysses S Grant attended school in Ripley and was boarded two doors down the block from the Strange’s house. Ben was in awe. He kept saying “I’m walking where famous people walked.” The way the Stranges restored their house can only be described as a work of art. The ride today was pretty much straight north on Rt 68 and turn right in Xenia on the bike path. Not a particularly scenic ride, but the weather was nearly perfect, and it was literally the only day of the trip which did not have major hills to climb. We had our ears pinned back like a horse running back to the stable. Our excitement mounted as we encountered familiar sights as we approached home. It’s hard to describe the emotion of seeing our house for the first time and realizing that we’ve made it. My little stoker did an amazing job and I am super proud of him! We skipped a section of the underground railway last year when my mom passed away. I asked Benjamin’s principal if I could pull him out of school for a couple weeks again this year. The principal basically said yes, Ben will learn more on the road with you then he will these last weeks of school. After a nearly 11 hour car ride, Andrea dropped us off at the Cochrane Recreational Campground in Alabama south of Aliceville. We set up our tent by the light of the car headlights, said our goodbyes and settled in for the night. A fierce thunderstorm whipped up around 11:00. I had to run out before it hit to batten down all the hatches. The morning was rather overcast and cloudy, ominous for our first day of cycling. The forecast was calling for thunderstorms all day long, increasing in likelihood as the day continued. We took off quickly, trying to get some miles in before being hit by the storm. We arrived at would have been our destination at Pickensville around 10:00 and discovered that the town consisted of just a couple filling stations for resources and a campground that was a couple miles off the trail. The weather was holding off for us, so we decided to pedal another 20 miles to Columbus. The weather conditions were actually quite good, in the mid-70s, overcast, and with a really good tailwind all the way to Columbus. Items to note while riding that reminded us we were in the Deep South included: a graveyard we passed with confederate flags, road kill including rattlesnakes and armadillo, and the boarder sign from AL to Mississippi was bedazzled with gun shots. We checked into a hotel in Columbus because the weather looked threatening. The minute we pulled under the hotel’s overhang it began sprinkling. We put our bike into our room and ran as fast as we could to the swimming pool and jumped in, clothes and all. Swimming in the rain is nice, and Ben was delighted for his first swim all year. We had dual function: swimming and rinsing our clothes off at the same time. Afterwards we settled into our room and enjoyed the evening in the protection. The storm absolutely cut loose, but we could watch it from the comfort of our own room. It was about 55 degrees when we woke up this morning. We decided to hang out at the hotel til things warmed up a bit. We didn’t leave until close to 11:00. It became quickly evident why it was so cold – the wind was coming straight from the north. Guess which direction we were headed? Any cyclist will tell you that a head wind is the worst. Also, Alabama and Mississippi have a practice that is very difficult for cyclists; they put rumble strips on the shoulder of secondary roads which basically renders the shoulder useless for cycling. The rumble strips are very aggressive – akin to riding down the middle of railroads tracks. Consequently, we were forced to ride on the left side of the white line constantly. Route 50 this morning was actually very heavily travelled, along with the rumble strips, and head wind; I had my eye on my rear view mirror most of the time which made for stressful riding. We fought our way up Route 50 to the little town of West Point. West Point is actually a really cute town. We hung out there for 2 or 3 hours, procrastinating the right turn we were going to take that would put us directly in a northerly direction. Fortunately the roads from West Point to Aberdeen were very lightly travelled; in fact, some of it was gravel. The gravel here is hard to manage because it’s sizeable – big chunks around 1” in diameter. When you hit a loose spot it makes the bike really squirrely. We were pretty spent by the end of the day. I will say Aberdeen, our destination today, is a beautiful city. They boast stunning antebellum homesteads. There was an option to camp here, but it was about 5 miles off the route. After the hard fought day, we decided to push the easy button again and stay in a hotel. It’s amazing what a head wind can do. We pedaled probably 10 miles less than yesterday and we’re probably 10 times more tired than yesterday. I would rate yesterday’s ride a solid A, where today would be about a B minus. I had two pretty major health setbacks since the trip that I made last year with Benjamin. In early September I broke my clavicle and had to have surgery with a plate and screws. Then the day after Christmas, I had a heart attack. Because of this I have made two accommodations to my rig this year that I did not have last year. First I took the clips off my pedals. Should I fall, I can catch myself with my foot, as my clavicle isn’t completely healed yet. I’m not excited about repeating that injury. I put super wide grippie pedals on and am riding in my Chacos; it seems to be working really well. I like the freedom of not having clips. I think it’s been helpful for my joints to have the flexibility to rotate my knee if I need to. Not to mention, I have taken advantage of the bailout feature more than once on this trip. I’m not saying that I would have fallen if I had clips on, but it was a lot less risky without them. The second modification is that I wear a heart rate monitor now. My cardiologist does not want me to have a heart rate greater than 145 beats per minute. So in addition to my bicycle computer, I have my heart monitor watch strapped to the handle bars giving me the correct bpm. There has been a real side benefit to that modification as well – my knees have not been bothering me nearly as much on this trip. As my heart rate increases to the critical point, I shift the gears down and am not pushing as I did before. So it’s really worked out pretty well. In the land where barbecue is king and vegetables are an endangered species a heart friendly diet is mighty hard to maintain. Today’s ride again was the opposite of yesterday’s. It was an extremely nice day. We had a decent tail wind and plenty of sunshine. It was the kind of day where the sun actually feels good. Temperatures ran in the high 60’s, low 70’s. When we took breaks, rather than finding shade, we rested in the warm sunshine. The third day in my experience cycle touring is always the hardest. Today was one of the best third days I have ever had. It was raining this morning when we woke up. We took our time leaving. The rain slowed down significantly by 10:00 so we headed up to town and ate a big breakfast at the Huddle House. Conditions today were quite pleasant, overcast, a bit of a tailwind, cool; really nice cycling. 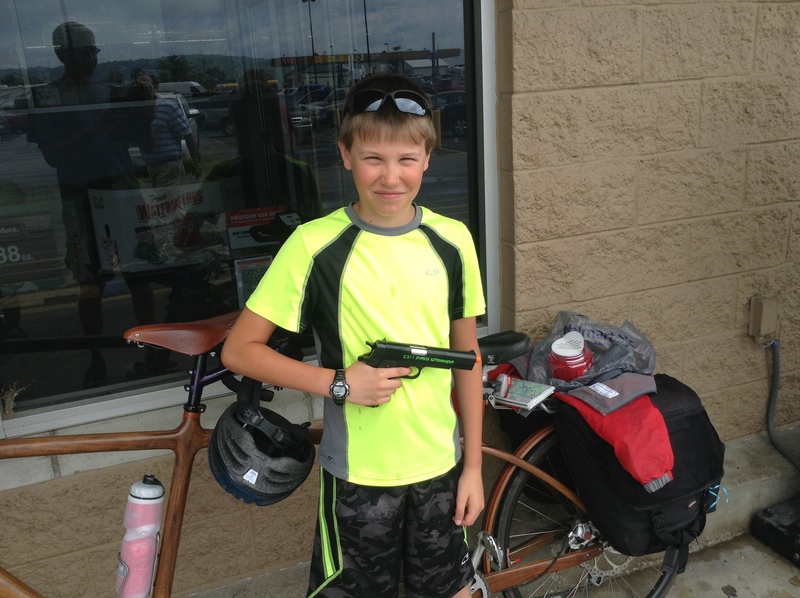 Ben has been very active shooting bike-chasing dogs from the rear seat with his air-soft gun. His ammo (6mm diameter plastic BB’s) accidentally fell off the bike. The bag broke open and spilled on the pavement. We stopped and tried to scoop up as much as we could. 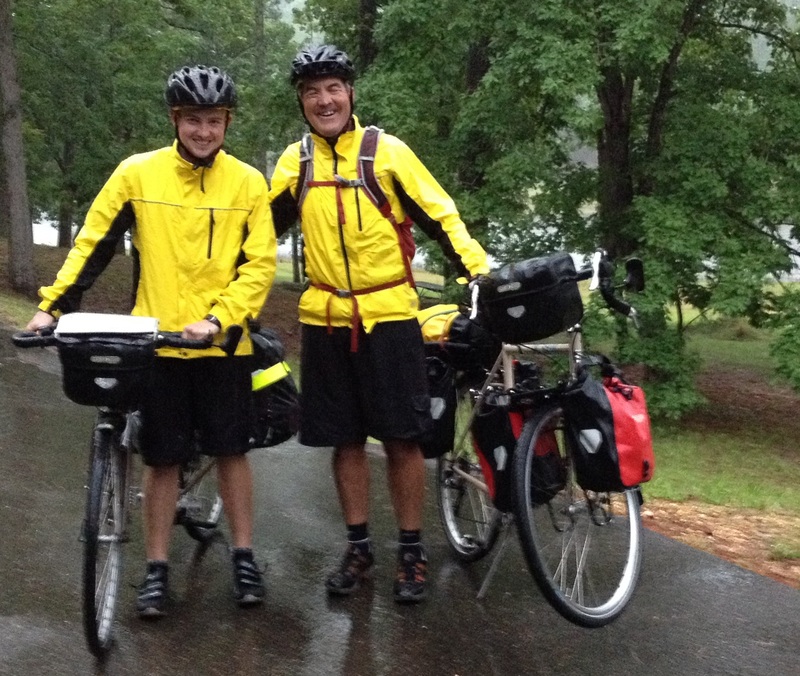 While in process, a couple cyclists came up on us – father and son team as well – Terry, the father, and Garrison Whitmore. They’re riding cross country. Terry is 56 years old and retired from the FBI. Garrison is 19 years old, majoring in Geography at Auburn University. They are riding “in honor of a little girl named Rachel- a courageous little girl in need of a heart”: http://www.facebook.com/RideforRachel2014?ref=profile. It didn’t take long to discover that Terry and Garrison are fellow Christians. 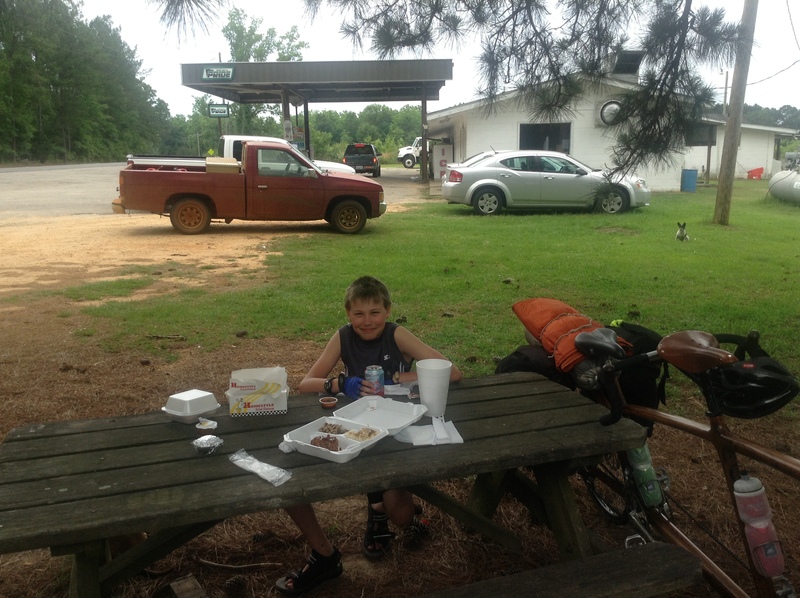 We had dinner together and shared a campsite at Tishomingo State Park. It was amazing how in God’s providence a spilled bag of BB’s brought us together. We had severe thunderstorms last night, and it was absolutely pouring rain at daybreak this morning. Terry and Garrison seemed undaunted by the rain and courageously packed up, ready to roll by 7:30. Ben and I emerged from our tent briefly to have a quick time of prayer and bid farewell to our new-found friends. We then crawled back into our tent and sleeping bags and listened to an audio book “The Adventures of Tom Sawyer”. Sometimes the freedom and adventure of cycle touring makes me feel a bit like Tom Sawyer or Huck Finn. Time means very little, and we hardly know from one moment to the next when our next meal will be and where we will spend the night. Our daily wardrobe is comprised of two outfits. We might as well be barefoot on a homemade raft, floating down a river, fishing for our dinner. Reality snaps back into focus when I remember my mortgage, two kids in college and the four “wrecks” that we drive and have to maintain. The rain lulled around 10:00 am, and we hastily broke camp and pedaled into town. We had a good breakfast at a local greasy spoon. By 11:00 the rain subsided to a slight mist. The moist conditions made it an ideal day for conditioning a leather saddle. It turned out to be a very pleasant day for cycling. We saw a live armadillo today for the first time, opposed to the dozens of smashed ones we’ve seen along the side of the road. The sun emerged brightly for the first time all day as we pedaled through Shiloh National Military Park. It was a surreal experience. We had the park almost entirely to ourselves. The warm sun induced steam fog on the monuments and artillery. The battle of Shiloh, April 6-7, 1862 produced more than 23,000 casualties. As we pedaled along I had the feeling I was riding on hollowed ground. The Warm Showers is a free worldwide hospitality exchange for touring cyclists. People who are willing to host touring cyclists sign up and provide their contact information: (https://www.warmshowers.org/). We have been part of the network for a little more than a year. About a dozen cyclists have used our home for a “warm shower” and we always throw in a meal or two, a real bed to sleep in, use of our washer & dryer, use of a car to run errands, repair their bikes etc. In other words, we spoil them. In my mind it is paybacks for the many times that strangers have kindly taken care of me and my family when we were cycle-touring. We have met some very interesting people and have heard some fascinating stories from our guests. Today I am on the receiving side of the warm showers network for the first time. Michael Goode is a retired attorney / businessman. His wife, April, is a retired public defender. 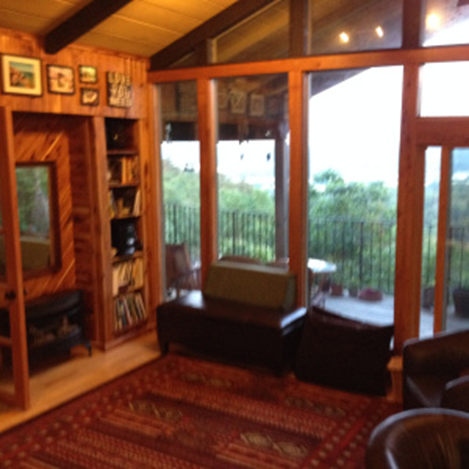 Their home is in a private community, located on a ridge that overlooks the Tennessee River. Michael met us at the base of the ridge sparing us the agony of climbing some serious heart-bursting hills. Benjamin was spellbound when we first entered their home. Later he proclaimed it to be “the coolest house ever”. Michael started with a rather humble weekend cottage and added some extremely interesting features over the course of a couple decades. He did all of the design and a lot of the construction himself. He incorporated a lot of surplus and “found” materials into his house. Some noteworthy features include a multitude of French doors, gigantic exposed douglas-fir floor joists, real wood paneling, a room that resembles a café complete with a booth, roof-top garden and huge windows that take advantage of the stunning view overlooking the Tennessee River. We enjoyed a grilled chicken dinner and salad harvested from their roof-top garden with fresh picked strawberries for dessert. We did our laundry with a real washing machine, as opposed to rinsing our clothes out in a sink, for the first time in 6 days. Michael and April were very kind and gracious warm showers hosts. It was a welcome treat because today’s ride was challenging. It was well into the 80’s, bright sunshine and hilly! Yee-haw: redneck-eze for our riding conditions today. We had an outrageously strong tailwind! We were cranking 16 to 18 mph all day, effortlessly. We literally rode two days in one today. 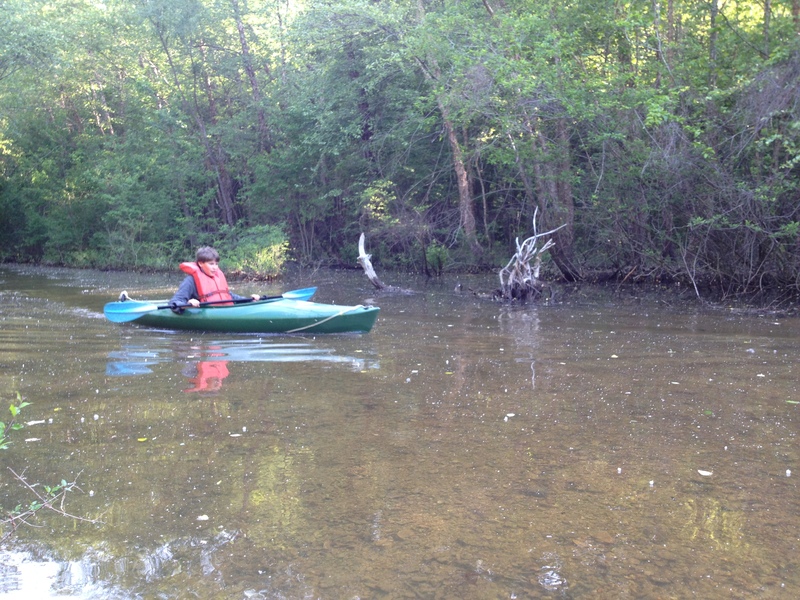 Michael took us kayaking on the Tennessee River early this morning. 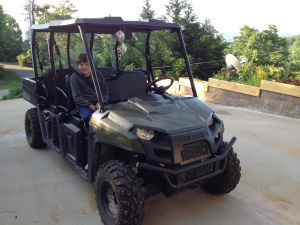 We took his four-seat, Polaris Ranger down the narrow ATV trail to get to the river. A ranger is an off-road, four wheel-drive vehicle with a full roll cage, high ground clearance and aggressive tread tires. It’s like a large golf cart on steroids. A couple hundred yards down the path, Michael decided it would be a good idea to let Ben drive the ranger. Ben was excited and took off rather fast. He didn’t have a good feel for the throttle. This was also the first time Ben has driven something that was left-side steering. He has ridden dirt-bikes and ATV’s, and in both cases they steer from the center. Consequently, he tried to drive the Ranger with his body centered on the trail which meant the right side of the vehicle was precariously close to falling over the ravine. Michael calmly coached Ben to drive more toward the left while making statements like “Oh, we wouldn’t want to go off the edge here because we would probably all die.” I was in the back seat as nervous as a cat in a room full of rocking chairs. Ben eventually got the hang of it. After our kayaking & rangering adventure we had a nice oatmeal breakfast, and Michael took us back down the ridge to our bike route. We pedaled through Camden which was large enough to have a Walmart. I prefer to patronize the smaller mom & pop type stores, but Walmart had something we were after: weapons! As I mentioned before, we use an air-soft gun to deter aggressive dogs. We have had an overabundance of dog chasings on this trip. Once we had five, uncollared, large dogs come after us at the same time. Ben emptied his clip, and they still kept coming. We almost wrecked. We were looking at Walmart for a second clip of maybe a second gun. I’ve gotten flack from folks that read my blog and accuse me of cruelty to animals. They probably don’t understand: a) a 6mm (~1/4 inch) diameter, plastic, air-soft bb is pretty harmless; a point-blank shot will sting and leave a red mark but it will not break the skin, b) dogs chasing bicycles can be extremely dangerous for the rider and the dog c) Ben and I are huge dog lovers. One time we were on a pretty busy road and a whole pack of dogs exploded from a front porch and crossed an oncoming lane of traffic to chase us. We heard the screeching tires and the sickening thump of car-on-dog. The dog limped off. Benjamin was mortified. “Dad, we have to go back and tell the owner.” The last thing I wanted to do was beat my way past a pack of angry dogs to knock on a door of someone who may be equally angry. We turned around anyway and went back. Fortunately the owner must of heard the commotion, too, because he was already out of his house. The dog seemed to be gimping but okay. We packed up our campsite and pedaled away by 7:30am this morning. We rode ten miles to Dover and had breakfast at a McDonalds. There is a play land at this McDonalds, and I asked Ben if he wanted to play for a while. He replied, “Like I really want to crawl around in a giant, pee-filled, plastic tube.” I guess the boy is growing up. Dover is the home of Fort Donelson. The capitulation of the fort on Feb. 16, 1862, earned Union Brigadier General Ulysses S. Grant the nickname “Unconditional Surrender Grant”. Victory at Fort Donelson assured that Kentucky would remain part of the Union territory during the Civil War. The majority of the day we spent pedaling the Land Between the Lakes (LBL) parkway which causes me to muse why Americans drive on a parkway and park on a driveway. The parkway was lightly traveled and closed to commercial traffic with the notable exception of a garbage truck that passed us three times, the smell of which nearly provoked psychedelic yawns. For better or worse, cycling exposes us to the fragrances of the world around us. On the plus side, the honeysuckle has been in abundance and in bloom during this trip. Cycling is also a great means for bird watching. I’m not much of a birder, though I wish I were. There seems to be an abundance of mocking birds and bluebirds here in the south. We enjoy the challenge of making sounds that the mocking birds will imitate. We bought a hand-held bird call at a gift shop at the entrance of LBL. Now Benjamin has a rear-seat activity that is more PC (Politically Correct) than plucking away at rogue dogs. People who only drive cars sometimes have a skewed perception of mileage. I knew today was going to be a long day, and I also knew that a thunderstorm was forecast for this evening. This is a good recipe for staying inside tonight. There are a couple choices for hotels in Grand Rivers; one is in the middle of the town and the other was on the north side of the city close to I-24. I called around noon to get the rates. The in town option was twice the cost of the one close to the interstate. When I asked the host how far north of town the hotel is she replied, “8 miles.” It really didn’t look that far on the map. We were completely out of gas when we reached Grand Rivers. Paying the extra denarii to stay at the “in town” hotel to avoid more pedaling was very tempting. After an extra-large milk shake at the local dairy bar and an hour of rest, my sense of frugality reappeared, and I was ready to tackle the extra mileage. I called again to re-confirm, and the host adamantly proclaimed that the hotel was 8 miles from town. I made a mental note of my odometer reading and, begrudgingly, we set off. 2.9 miles later, we arrived at our hotel. Final Day, Grand Rivers KY to Cave in Rock IL 63 miles. I am confident that God’s hand is on us every day. Some days are more evident than others. Today was an “evident day”. When I woke up this morning, Debbie Erwin (now Hendrix) came to my mind, perhaps because I know she lives in Kentucky. Debbie was a friend from high school & early college years in Fairborn, Ohio. It’s been ages since I’ve seen her but we’ve been in touch through Facebook for a couple years. I didn’t know where she lived in Kentucky. I “Facebook stalked” Debbie this morning. She was clandestine about listing her city on Facebook, but I found a classifieds site on her page for Livingstone County. That’s where we are! I sent Debbie a Facebook message right before we shoved off this morning. 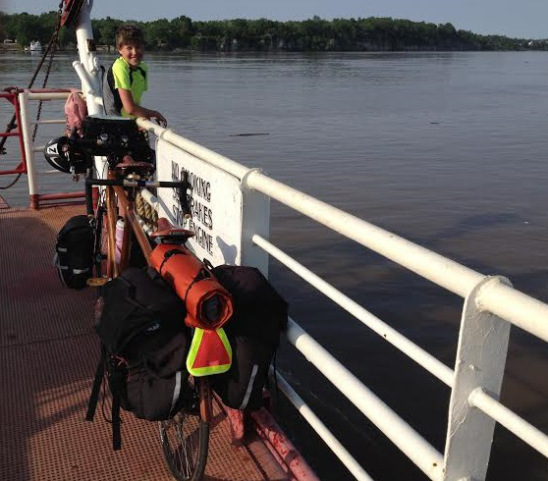 We pedaled twenty miles to the town of Smithville which is located at the confluence of the Cumberland and Ohio rivers. Whenever people ask us where we’re headed on this trip we reply “the Ohio River”. Seeing the Ohio River gave me a great feeling of accomplishment. I checked my messages while resting and reveling in the view of the two great rivers. Sure enough, Debbie replied to my message and, after some back and forth chat, we discovered she lived about twenty miles away and virtually on our route. As we pedaled along the scenic river road toward Debbie’s house, we were startled by an explosion of thrashing branches and leaves from the trees overhead. It was a bird-flush of epic proportions: a bald eagle! He soared out over the Ohio River parallel to us, less than 30 yards away. A few moments later a second, slightly smaller eagle joined him which I assume was his mate. Under the president, Andrew Jackson administration, the Indian Removal Act was passed in 1830. Five peaceful Indian tribes were forced to move from their well-established, civilized homesteads to reservations in the virtual wasteland of Oklahoma. Our route today followed the dubious “Trial of Tears” where 16,000 Cherokee Indians plodded through the harsh winter of 1838. It was an embarrassment in our nation’s history, evidence that our government is fully capable of being amoral. I wonder how Native Americans can tolerate twenty-dollar-bills which bare the visage of Andrew Jackson. It did not rain as predicted last night, nor was it raining this morning. Instead it was one of those blistering hot days when some precipitation would be most welcome. I felt like a giant sweat ball when we arrived at Debbie’s house. She greeted me with a big hug in spite of my warning. Debbie’s teen-age daughter, Emily, chalked a giant welcome sign on their front porch. We were treated to some mint tea as Debbie and I tried to catch up on score-plus years of life. Ben and Emily really hit it off. Emily is an accomplished musician and an enthusiastic marksman, just like Ben. Debbie and I were humored by their conversation about muzzle velocities of various air-soft guns. Our visit was limited to about an hour because Andrea is in route to meet us today to take us home. We started pedaling east again to close the gap between us and Andrea as much as possible. 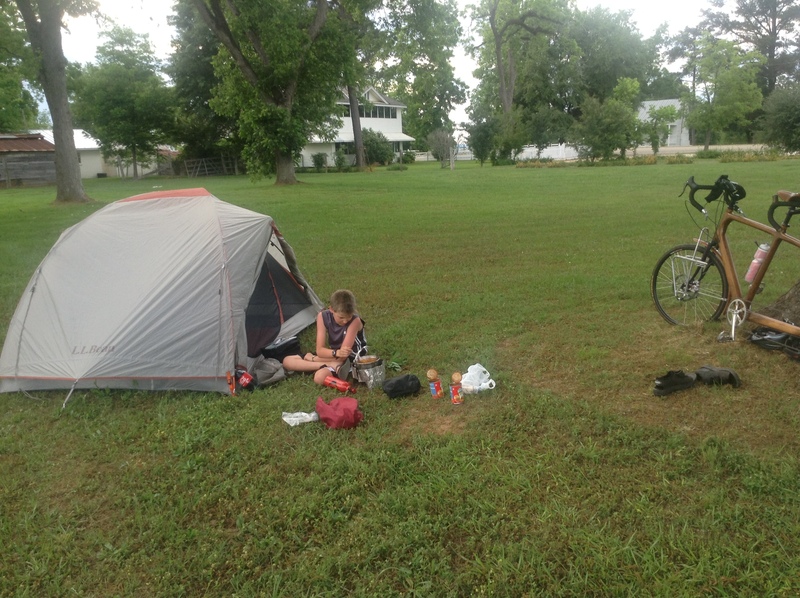 We pedaled on another fifteen miles to Tolu, Kentucky which was nothing more than a wide spot in the road. There was one public shady spot in the whole town, the porch of the volunteer fire station. It had a soda vending machine. The shade and the prospect of a cold drink were like a magnet to hot and thirsty bikers. Another father-son biker team was drawn to this spot as well. Don Verhines and his son, Dawson, are the kind of bikers that use a throttle. I used my standard line when I approach a motorcyclist, “Wanna trade?” When I told Don we live in Cedarville, Ohio he perked right up. It turns out that Don is a pastor and is quite familiar with Cedarville University. The immediate commonality I have with brothers in Christ is marvelous. Don and I along with fifty thousand of our closest friends attended the same Promise Keepers event in Indianapolis, Indiana in the mid-nineties. Our tentative rendezvous town was Sturgis, Kentucky, another hot and hilly twenty miles away. I called Andrea and pitched the idea of meeting at Cave in the Rock, Illinois instead. It would add a half hour to her drive but it would do four things for us: 1) shorten our day from 75 miles to a more sane 63 miles. 2) add another state to our repertoire 3) it would be interesting to explore the name sake of the town “Cave in the Rock” 4) it would give us the opportunity to cross the Ohio River on a ferry! I love taking ferries on bicycle tours. It feels so exotic to pedal up the steel ramp and strap my loaded bike to the rail of the boat. It takes me back to rides I’ve done in the San Juan Islands, Canada, Ireland, Norway and New Zealand to name a few. Ben was too young to remember our ferry ride in the San Juan’s so he was thrilled! We did explore Cave in the Rock which was fascinating! Rose’s Kountry Kitchen was “the” place to be on a Thursday night in this small town. We talked to many friendly locals as we dined. Benjamin had a ginormous blue gill sandwich. It was yummy! It reminded me again of how intimate bicycle touring can be. If we were traveling by car, we probably would have booked it back to the main road to have our generic, bagged meal shoved through a take-out window with the only local interaction being a voice on a staticky speaker verifying my order. Andrea pulled up in our mini-van just as we left the diner. It was great to see her! We loaded up our gear, and I climbed behind the wheel of a car for the first time in nine days. It always amuses me when I drive a car for the first time after a bicycle tour. I’m driving 45 mph, and it feels like I’m going a thousand miles an hour after days of lumbering along on a bicycle. It’s been a great trip! 460 miles, only one flat tire, countless dog-chasings, a few rainy days, fewer head-wind days, many tail-wind days, some interesting history lessons, new friends, one re-acquaintance, more than enough logging trucks, spectacular scenery, exposure to foreign (southern) culture, sense of closure for completing the trip and best of all, some good father-son “bro-time”.